My days are seriously mixed up. 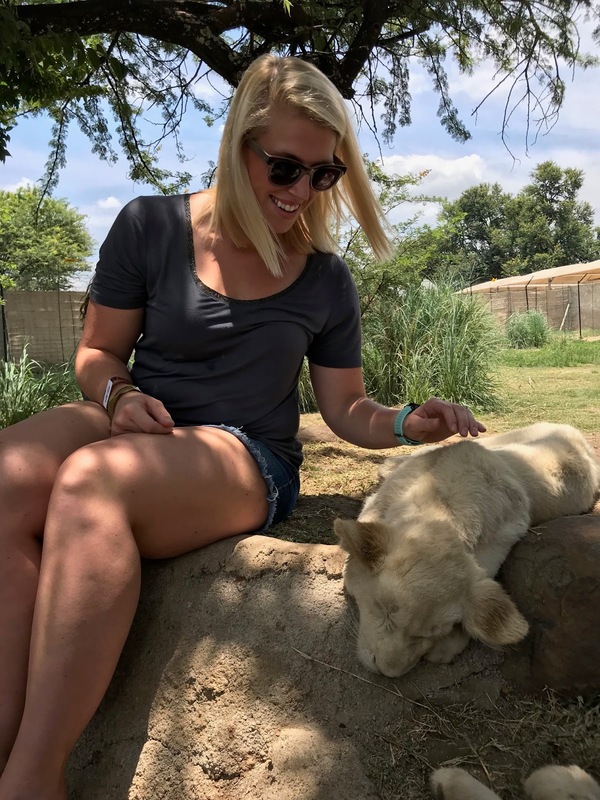 After 3 weeks in South Africa where I didn’t have to track time, days, or work, I really lost track of where (and when) we are. But, apparently, it’s Friday again, or so my watch tells me. I’m going to detail our trip more thoroughly in the coming days, but I can’t think a better way to kick off all the recaps than wrap up our top five moments of our travels this past month. I’m linking up today with Smidge of This for 5 on Friday and Meet at the Barre for Friday Favorites. 1 // Flying to South Africa was an adventure this time. When I booked our flights, I knew we obviously needed the boys’ passports. I did not, however, see that South Africa had changed their policies and required original birth certificates, as well. We showed up to fly on the 8th of December, and we weren’t allowed to board because we didn’t have them. 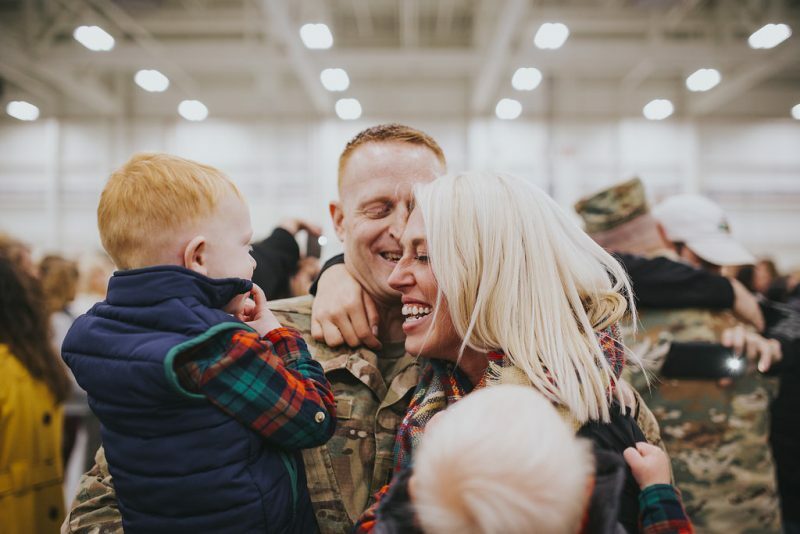 After our amazing neighbor scanned them for me, and we got them notarized, we were able to fly on the 9th instead – only missing one day of our trip. 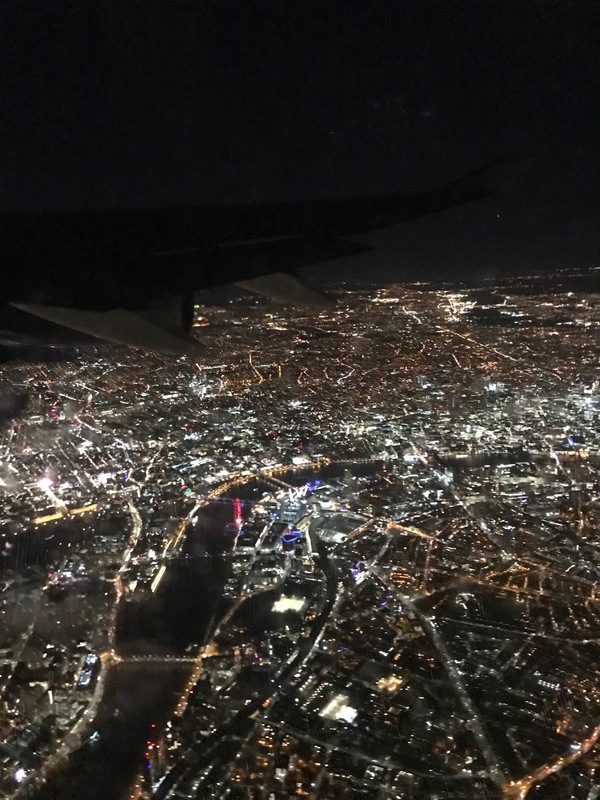 It was early in the morning, and we were all exhausted when we connected in London, but we saw some incredible sights, including the Eye of London in all its glory. 2 // Christmas wasn’t all that Christmas-y in South Africa, but the malls were definitely decked out in all their finery. 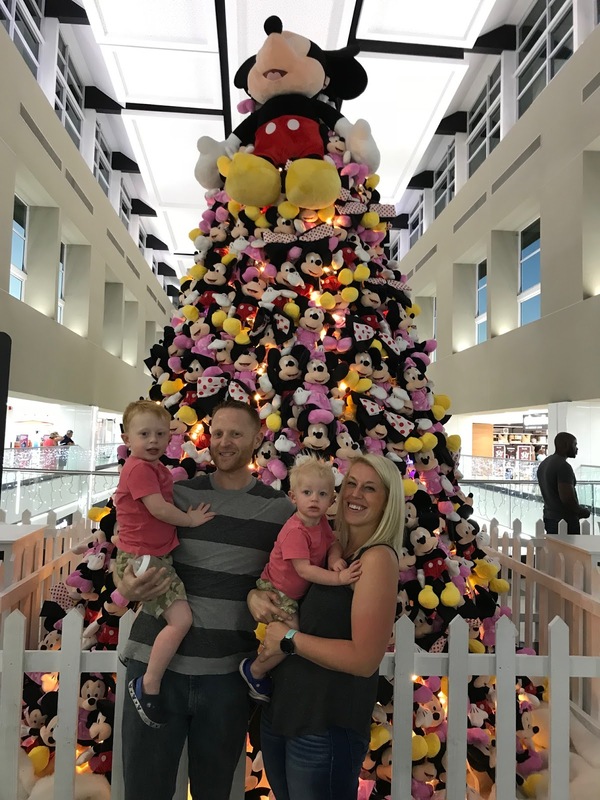 My cousin, Angie, told us about the Mickey Mouse Christmas tree at Menlyn Mall in Pretoria, so we decided to head over there one evening to surprise our biggest Mickey fan. Needless to say, Spencer was totally in awe, acted like it was the second coming of Christ, and screamed with joy for several minutes. 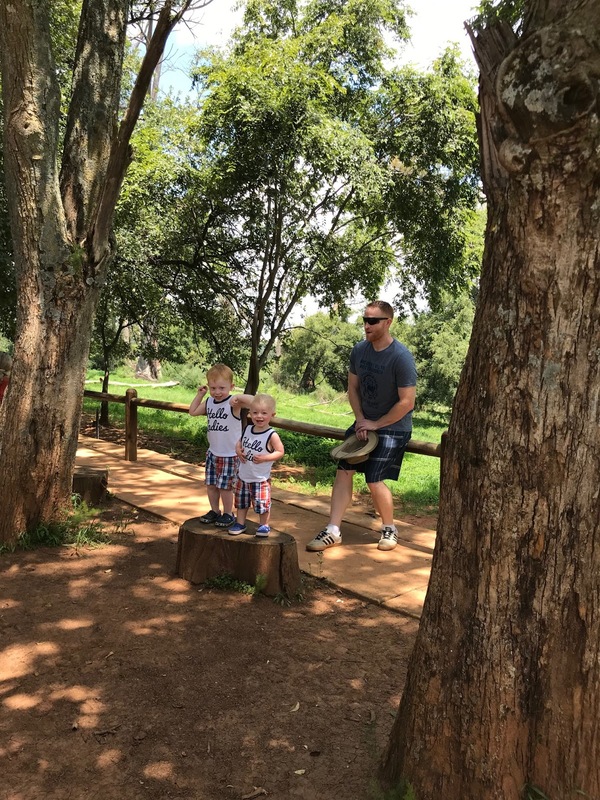 3 // We made a point of seeing as much as possible around the Pretoria area (where my family is) while we were there. We stayed with my aunt and uncle, but my aunt isn’t in the best health, and she relies heavily on oxygen these days. So, we didn’t get to travel as much as we wanted to. Luckily, there are a lot of things nearby so the boys could see the animals without traveling too far. 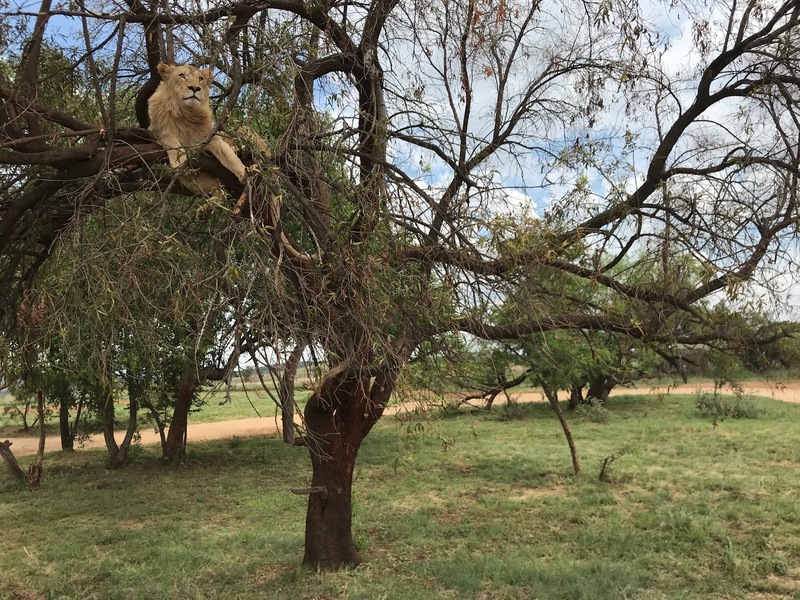 We headed to Krugersdorp to the Lion & Safari park, and I was able to pet a baby lion, and we saw one climb a tree. Too cool! 4 // If you follow me on instagram, you’ve probably seen it, but we ran into a big ol’ South African roadblock at the Rietvlei Nature Reserve one day, and it was too funny. We also had lunch there at the old camphouse, and it was the best. The boys found a stump upon which to entertain all our fellow diners with their rendition of the Hot Dog Dance from Mickey Mouse. It was charming (and hilarious), coupled by their fantastic shirts. 5 // The whole darn trip was lovely, and though we were definitely ready to come home, it was so great being able to share this world with my boys. 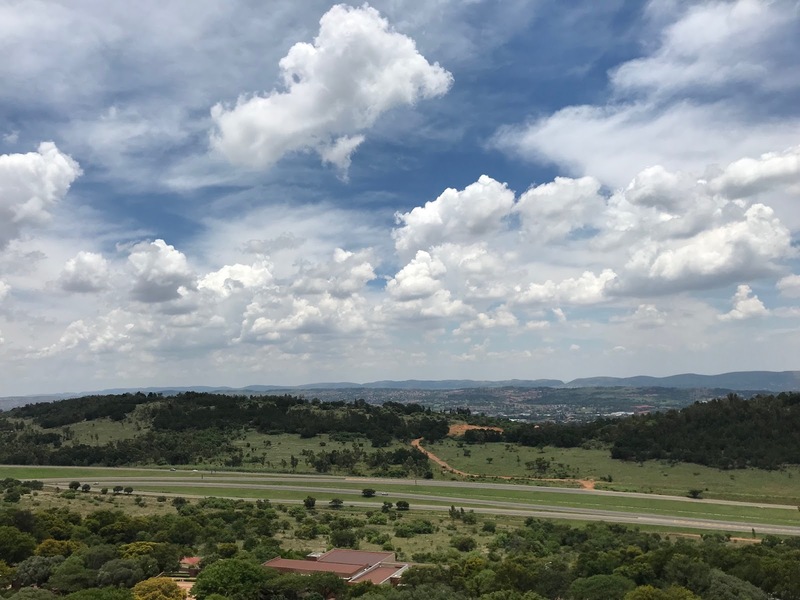 We went to the Voortrekker Monument one of our last days there, and though I’ve been a few times before, seeing the views of Pretoria and the land my momma is from was just so special. It was beautiful, and I’m so glad we had this opportunity to spend time together in this wonderful country. We really had such a great time, and though we’re decompressing for a few days in New Hampshire, we’re heading back to New York to get the ball rolling on PCS season tomorrow. It’s going to be full-speed ahead for the next 6-8 months before we move, and I’m excited, nervous, scared, and so so ready to see what’s next for this little family of mine.